The goal of the Primary Care Paramedic Program is to develop individuals into paramedics who possess sound knowledge and skills, an unwavering commitment to excellence in all that they do, and a deep sense of professionalism and caring. The program aims to meet the competency requirements of Emergency Health Services of Nova Scotia (EHSNS) and the Paramedic Association of New Brunswick (PANB); as well as the National Occupational Competency Profile, as established by the Paramedic Association of Canada, for Primary Care Paramedics. 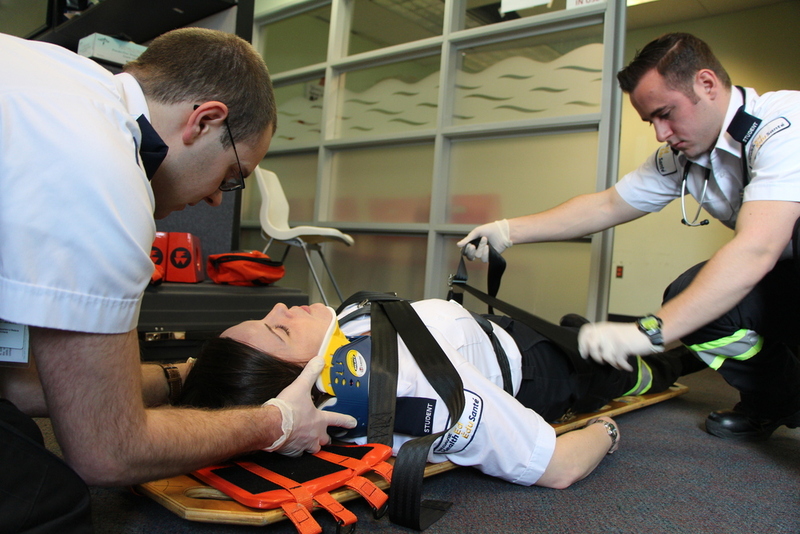 Graduates will not only be an asset to the profession of paramedicine, but to the communities they serve as well. The program is designed to provide the acquisition of concepts and theories, mastery of professional skills, and the attainment of a professional attitude. One of the key objectives of the program is to instill a commitment to lifelong learning. Because the medical field is constantly changing and evolving, an emphasis is placed on the development of self-directed learning skills. In addition to supporting the development of self-directed learning techniques, faculty serves as both academic advisors and facilitators. With the responsibilities of paramedics increasing, it is no longer acceptable to simply accumulate a set amount of knowledge and skills. Today’s students must be inquisitive and dedicated to continuously expanding their expertise and abilities. The Primary Care Paramedic (PCP) program is 44 weeks in length which includes 6 months of classroom/simulation training, as well as 4 months of clinical and practicum training. Tuition for the program is approximately $16,500 which includes cost of books and uniforms as well training and resources for obtaining class 4 driver’s license. Must be at least 19 years of age within the first six months of the program. Math at the grade 11 or 12 university preparatory level and one science at the grade 11 or 12 university preparatory level. Grade 11 or 12 English university preparatory level. Be physically and mentally able to perform all required duties. Qualify for Class 4 driver’s license (please check with your provincial Department of Transportation or Motor Vehicles Branch for the jurisdiction where you reside) if you plan on applying for work as a PCP with an ambulance service. Be in good health with all appropriate immunizations as verified by a completed immunization record. Supply a current copy of his/her driver’s abstract. To obtain a driver’s abstract you must contact the appropriate provincial Department of Transportation or Motor Vehicles Branch for the jurisdiction where you reside. Supply acceptable Criminal Record Check with Vulnerable Sector check. This can be obtained from the RCMP or local police detachment. If you do not have the above academic prerequisites, you MAY be able to apply as a “Mature Student” in New Brunswick. A “Mature Student” applicant is not required to have completed high school / college courses as required to apply as a general candidate (see above). Must be applying for a course offered in New Brunswick. Be at least 21 years of age and out of school for a minimum of one year. If the Mature Student applicant does not have the mandatory academic requirements they complete the Canadian Adult Achievement Test (CAAT). A Mature Student is required to pass the test overall and must also pass the Math and Science portions of the test. c) Three Letters of reference. Application fee – $100.00 by personal cheque or money order / bank draft or by Visa / Mastercard by calling 1-888-798-3888. Attend an interview with designated Admissions Representatives. An official Criminal Record Check which will need to include a vulnerable sector check. The criminal record check must be no more than two months old from the program start date. Medical and immunization forms. The medical and immunization forms must be no more than two months old from the program start date. To download the medical form, click here, and to download the immunization form, click here. Acceptance into the PCP program remains conditional until such time all of the above are received and verified and approved. Students are also required to purchase an iPad that has not been “jail broken”. Students must ensure that the iPad is supported by Apple for the duration of their program (According to Apple, iPads are supported for five years from their release date). The student will receive a diploma upon successful completion of all program requirements as outlined in policy.